What if you discover one day you had extraordinary powers? Will you use it for good, for evil or for plain fun? "Chronicle" stars Michael B. Jordan, James Dehaan and Alex Russell as high school kids who developed extra special powers after being exposed to a mysterious thing in a cave. Beyond their understanding, their powers direct them to incredible discoveries and use them to their advantage as their lives start to spin out of control while their darker sides begin to take over. Directed by Josh Trank, "Chronicle" is another film to use the found-footage technique such as "The Blairwitch Project" and "Cloverfield". Catch the awesomely good trailer after the break. 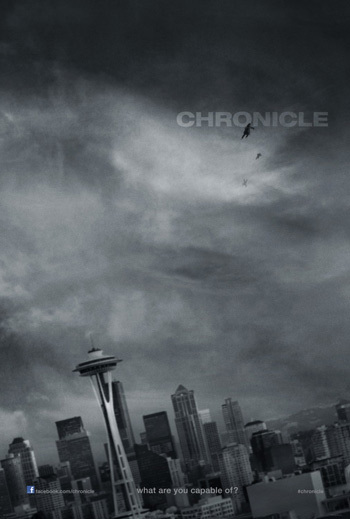 "Chronicle" opens March 2012 in the Philippines while the United Kingdom gets it earlier on February 3, 2012 from 20th Century Fox to be distributed by Warner Bros. in the Philippines.